Nigeria offers a potpourri of beautiful diversity in their music traditions. That tradition is eloquently featured in Sonia Aimy, a gifted singer/songwriter from Benin City, located in Nigeria’s southern region. Aimy relocated to Italy for to study in theater and music. Adorned with creative lyrics, with lush instrumentation, Nigerian Spirit is invocation for optimism, presented in a jazz underpinning, blended with aspects of highlife, juju music, and touches of gospel. Sonia is a world traveler, currently based in Toronto, Ontario Canada where a portion of this record was recorded, the remaining sessions were produced in Lagos, Nigeria, and Cotonou, Benin Republic, both on the West African coast. The Africa sessions feature the cuts “Light My Way Mother,” a delightfully light spirited tune, featuring bi-lingual lyrics about motherly love and guidance in trying times. Aimy is fluent in English and Italian, in addition to several African languages, her ability to flawlessly sing in various dialects is breathtaking. Evidence of her eloquence is in full display on “Chotima,” sung in the Obamba language of Gabon. The African sessions continue with a more pop-infused-afro sound on “Dreaming,” and a depth of message on the hopeful “Dream for Somaliya,” which focuses on the struggles the country endures year after year. Recorded in Canada, the title track is Aimys’ voice in full bridle of the magnitude of outrage at the kidnapping of young Nigerian girls by the Boko Haram terrorists. Her heritage traces to the Yoruba people and sings ancestral praises in “Voices of Orisa.” The Yoruban theme continues on “Ase,” an illuminating tune that is a prayer for peace on earth. A highlight of the albums is Aimys’ composition “Lampedusa,” an emotional tribute to a small Italian island in the Mediterranean, unknow to many, this is where countless refugees attempt to reach regularly and sadly, many dye trying to reach a better life, which the local island gladly welcomes and accepts refuges in need. A socially conscious album would not be complete without a bit of light-hearted fondness and “Husband in Canada,” fits the bill. Aimy not taking herself too seriously gives an entertaining reading on an African woman looking for a husband in Canada, humorously equating and comparing the men back home to the ones available in Canada, with amusing result. 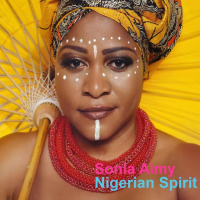 Sonia Aimy comes from a proud lineage of African women singers, descendants of the griots. She, as those who came before, honor a personal obligation to carry the message for those left behind, back in their homeland, who cannot speak for themselves. Her music is not a path of pure entertainment, it is socially conscious driven, it is her duty to use her voice to bring awareness to horrific human conditions such as; human trafficking, famine, war, neglect, violence and justice for human dignity. She is the voice of change, she is the voice for Africa. Be the first to comment on "Sonia Aimy | Nigerian Spirit"